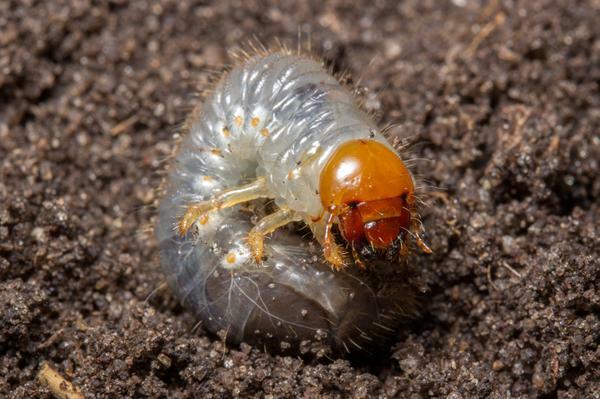 White grubs are the larvae of scarab beetles. The grubs of economic importance in North Carolina are those of the Japanese beetle, the green June beetle, the southern masked chafer, the northern masked chafer, and the Asiatic garden beetle. Several other species, such as May beetles and June beetles, are also present but usually in low numbers. The Japanese beetle is consistently the most damaging grub in this state. Two relatively new pests, the turfgrass ataenius (on bluegrass) and the oriental beetle, are present in western North Carolina. These insects appear to be expanding their range and may become serious problems in the near future. All these grubs have cream colored bodies with yellow to brownish heads, brownish hind parts, and six legs. Mature grubs vary in length from 1⁄4 to 11⁄2 inches, depending on the species. White grubs usually lie in a curled or C-shaped position. Billbug larvae may also be present but can be distinguished by the absence of legs. The timing of the insecticide application is critical if control is to be effective. There are two approaches, preventative and curative. Some of the newer products (Merit® and Mach 2®) are preventative, and are most effective when applied prior to when the eggs are laid. This approach should only be used in areas that have a history of grub infestations. The curative approach is used when an existing infestation is detected. The best time to apply curative insecticides is when the grubs are actively feeding near the soil surface. Pesticides applied any other time will be ineffective. This feeding occurs from August through October, and again in April through early May. Curative treatments applied in late summer or fall are usually more effective than spring applications because the grubs are small. Specific timing depends on the species of grub, and on location in the state. Timing of applications in the mountains will generally be later than in the eastern part of the state. Timing of applications for control of the turfgrass ataenius varies. No matter which product or approach is selected, be sure to follow label directions. 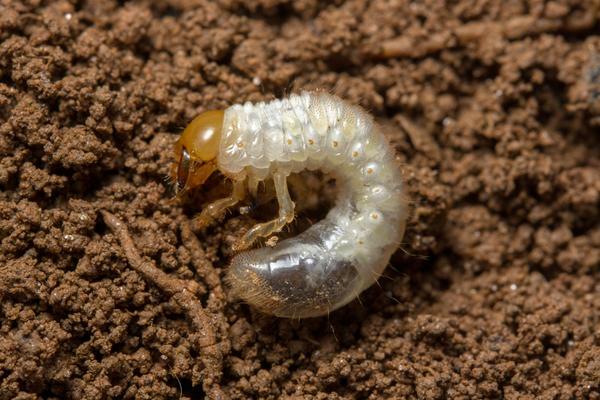 Recommendations for insecticides approved for control of these insects in home lawns can be found under the white grubs listing in the North Carolina Agricultural Chemicals Manual. Recommendations for insecticides approved for use on sod farms, golf courses or other commercial sites can be found in the North Carolina Agricultural Chemicals Manual. Recent studies indicate that traps for Japanese beetle adults have no real impact on the subsequent population of grubs in the soil. The use of Japanese beetle traps can also attract the foliage-feeding adults into areas where they may feed on ornamental landscape plants. Because environmental conditions, methods of application by growers, and performance of the chemicals may vary widely, control results may also vary. For additional information on insect control, timing and pesticide use contact your county Cooperative Extension center. chlorantraniliprole (Acelepryn) 0.184 to 0.367 fl oz Optimal control when applied at egg hatch. Use higher rates later in summer. chlorpyrifos* (Dursban) 50 WSP, Pro See label For use on golf courses; see new label. *Products in bold applicable to Green June beetles only. Carolina Lawns: A Guide to Maintaining Quality Turf in the Landscape. Miller, G. et al. 2016. NC Extension Publication AG-69. Effective Mole Control. Comer, G. L., Jr. and A. D. Rodewald. 2002. Ohio State University Extension FactSheet W-11-2002. Handbook of Turfgrass Insect Pests, Second Edition. Brandenburg, R.L. and C. P. Freeman. 2012. Entomological Society of America Latham, MD. 140pp. Identification of White Grubs in Turfgrass. Shetlar, D. J. and J. Andon. 2012.Ohioline, Ohio State University.